The EPIRB Tester is designed to decode and display the encoded message from a 406 MHz Cospas-Sarsat Emergency Position Indicating Radio Transmitter. The tester can be connected directly to the EPIRB or monitored "over the air" using the supplied whip antenna. The tester will decode any 406 MHz aviation protocol for EPIRB's. A complete measurement solution. Measures all Cospas-Sarsat frequency channels and decodes all Cospas-Sarsat protocols. Measures 406 MHz parameters, 121.5 MHz parameters modulation, and the in-band 406 MHz frequency spectrum. The beacon industry is demanding higher quality from 406 beacons and is implementing more thorough periodic testing. EPIRB Testers that only decode the 406 message are not suitable to meet the increasing demands from the industry to ensure the beacons are indeed operating properly. The EPIRB Tester provides thorough beacon measurement capabilities. 1.Tester provides measurement of 406MHz frequency carrier with accuracy +/-500Hz. NOTE: The operation frequency range of the tester is expanded to 406018…406048kHz and is divided on six subranges.The default subrange is 406023…406028kHz. The operation ELT frequency should be in subrange. 2. Tester provides the audio control of sweep-tone of 121500+/-10kHz carrier frequency. 3. Tester provides the reception and decoding of emergency message either in HEX format (separately 1-112 bits, 26-108 bits, 26-85 bits, 113-144 bits), or in text format with main message's parameters. Besides, the BCH code is calculated to be compared with accepted. 4. 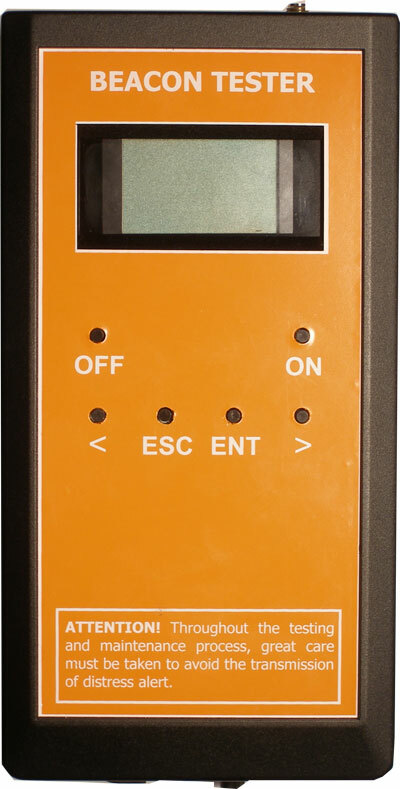 Tester measures the positive and negative phase deviation of modulated signal with accuracy upto +/-2,8 degrees . 5. Tester provides estimation of message transmission total time with accuracy upto 0.2% and preamble duration with accuracy of +/-0.2%. 6. Tester provides measurement of received signal level on 406MHz frequency in range of 19...40dBm or 0,08...10W with accuracy +1/-5dB. 7. Tester provides measurement of received signal level on 121.5MHz frequency in range of 13...20dBm or 20...100mW with accuracy +/-3dB. 8. Tester allows to carry out the measurements either by HF-cable or by means of external antenna in distance of 1.5..4m; the recommended distance is 2-3 meters. 9. The HF input resistance is 50 +/-1,5Ohm. 10. Tester allows to save upto 10 measurement results in its memory. 11. The total time of one measurement cycle is not more then 2 minutes. 12. Tester is power supplied either by external 5,2…9DCV source or by 4 AAA type 1.5V batteries.
" in measurement mode with LCD highlighting - not more the 200 mA . 14. The estimated total time of operation supplied by batteries is 6 hours. 15. Tester is automatically turned off in 15 minutes without its usage. 16. Tester displays the voltage of internal batteries with accuracy upto 5%. Also we can offer you the tester which is intended to check all kinds of aviation Emergency Locator Transmitters - ELT TESTER . At least we can offer you professional high-accuracy beacon tester BT-611 usually used by laboratories, manufacturers or during field beacon tests.